These complimentary kits include information and items intended to provide support and comfort to Colorado women who receive an ovarian cancer diagnosis. 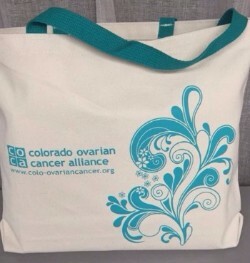 If you have been diagnosed with ovarian cancer and are currently in treatment in Colorado, the Colorado Ovarian Cancer Alliance (COCA) will provide a free kit of items to you for use during chemo & beyond. Comfort Kits include a copy of COCA's 75-page Ovarian Cancer Resource Guide, information about COCA programs including Nicki's Circle Support Groups, a soft teal blanket, canvas bag, sample items to help with chemo side effects, and more! You can order a Comfort Kit online and have it sent directly to your address. Or, we can arrange a delivery of several kits to your hospital or clinic. PLEASE NOTE: We only serve women in COLORADO and do not ship Comfort Kits to other states or countries. If you or someone you know has been diagnosed with ovarian cancer, please click link above to fill out the Order Form.